This lesson introduces the use of coordinates to store data or the results of mathematical operations. 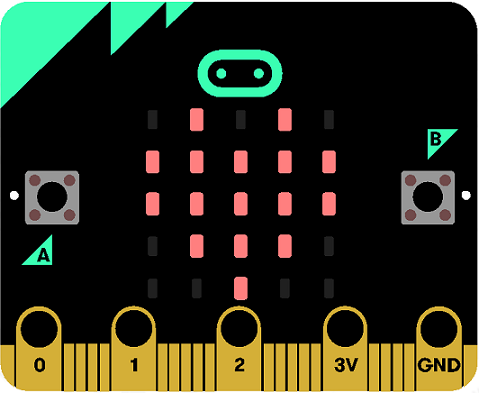 It gives students practice programming for the LEDs of the micro:bit screen using coordinates, and introduces the basic game blocks of MakeCode. Understand that the 5 x 5 grid of LEDs on the micro:bit represents a coordinate grid with the origin (0,0) in the top left corner. Understand that the values of the x coordinates range from 0 through four and increase from left to right. Understand that the values of the y coordinates range from 0 through four and increase from top to bottom. Learn how to refer to an individual LED by its X and Y coordinates. Learn how to plot (turn on) and unplot (turn off) individual LEDs and how to toggle between these two states. Learn how to check the current on or off status of an individual LED as well as check and set the brightness level. Apply the above knowledge and skills to create a unique program that uses coordinates as an integral part of the program.